Our team of experts at Woodstock IT thrive on providing IT support and solutions across Guildford. There is no doubt that we have become very reliant on technology over the years, but not all of us want to deal with the “techy stuff”. Taking a people first approach is our first step towards making everything easier. We never think of any issue as too big or too small – our priority is to provide IT support that is jargon-free and just works. It’s as simple as that. Woodstock IT have been looking after our IT infrastructure for a number of years now. They understand our needs and recall the details of the system better than I do! They are always available to assist in the event of any issues arising. Just recently they were instrumental in the setup of our new offices in Guildford and Godalming; I was able to focus my efforts on other aspect of the project and knew I could trust them to design and implement an appropriate set of technologies to meet our varied requirements. I hope to continue working with Woodstock IT for the foreseeable future. Here at Woodstock IT, we aim to be the people you can trust to get the job done. With a high level of knowledge and understanding of customers’ needs – from corporate to personal – rest assured your issues will be fixed swiftly and to a high standard. Need your personal laptop screen repaired? Want trustworthy antivirus software installed for your workplace? You can rely on us to get it done! We are the experts – our team have a high level of knowledge and understanding of customers’ needs – from corporate to domestic. Friendly and approachable team – we develop strong working relationships and aim to keep our advice as jargon-free as possible. Rest assured you can call on us for help at any time. We offer a huge range of services – services we offer include business broadband, structured data cabling, cloud solutions, WiFi solutions, network health checks, office setups, office moves, computer repairs, laptop repairs and so much more. We cover pretty much everything you can think of when it comes to IT, so why choose anyone else? On-site support in – we undertake a lot of work in the area and will be with you to resolve any issues in good time. If necessary we can offer remote IT support. To get more information or to arrange a visit, call us on 01403 290 321 or email us at [email protected] We are open Monday to Friday 8am-6pm. The county town of Surrey, Guildford is 27 miles south-west of central London, making it a bustling yet characterful town. Within easy reach of Heathrow and Gatwick airports, it’s largely a centre of travel. 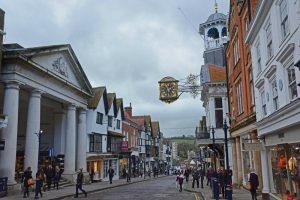 Along the high street are high-end retail and department stores, as well as estate houses through the town – historical and modern are one big mix in Guildford! With over 65,000 people populating the area, it will always have a high demand for solutions within IT.